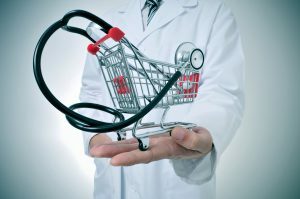 ‘Ubers of Healthcare’: Consumers need to be involved in their own care, and there has been quite a bit of innovation to provide greater transparency. Novel ways of getting care will continue to be developed, particularly in the area of delivering real-time, on-demand care – think Uber. Uber is not so highly valued because it’s a good car service, but because they have created a platform to identify – in real time – a surplus that exists within the economy and make it available in a spot market to meet consumer demand. Healthcare is ripe for this type of technology, especially for commoditized healthcare services like one-off prescriptions, vaccinations or sports physicals. Revenue Race to the Bottom: Health systems know they are in this race, but they’ve been slow to acknowledge it. 2015 marked the first time that health systems spoke with credibility about how they might achieve sustained success with bundled payments and risk-sharing after successful pilots. Some of the more successful ones are truly making substantial cuts in costs. But is it a one-time cost cut? Or are they truly changing the rate of spending? Either way, health systems are reestablishing themselves at a lower spending benchmark that they will need to keep repeating. How much blood can you possibly squeeze out of this stone? It’s a vicious cycle: every new cost reduction quickly becomes the new baseline of what health systems must improve upon. Resistance to reimbursement pressure won’t carry the day, so expect to see business model innovation by health systems with tiered services for at-risk vs. concierge-oriented populations that can pay up for certain services. Both care models and business models must continue to evolve to address margin challenges. Health Systems can Drive the Interoperability Agenda: The ONC’s interoperability roadmap released in 2015 left much to be desired, and for all the talk about the promise of FHIR, the reality is that it is years away from making a significant dent in today’s challenges. In 2016, the worst offenders of interoperability and data blocking will double down on these far-off “dust in the eye” tactics that will distract from the reality that more effective means of interoperability already exist today if vendors opened up. Health systems must see through these distractions and fanfare around initiatives that fall far short of addressing the real need. Others must step up by helping health systems and the federal government get their act together and do something real. This humble letter to Congress is a step in the right direction. In addition, I am inspired by and optimistic about the mission of The Center for Medical Interoperability, which brings health systems together to organize and develop effective tools today, rather than rely exclusively on vendors to set the interoperability roadmap. This will be a powerful platform for health systems to set and execute on their priorities to improve care delivery. Gadgets Under Scrutiny: Not all sensors are bad, and not all sensors are gadgets. However, those geared toward ‘recreational’ health data will start to experience a loss of credibility in the bona fide healthcare delivery space because the value proposition falls short. While sensors that allow a consumer and a decision-making clinician to interact through smart technology in the context of real, meaningful data is extremely beneficial to patient care, the Silicon Valley gadget mentality that drove the creation of so many hot new apps and wearables will get tempered as many of these technologies struggle to create value. The end result will be a slowdown in venture backing in this space, creating a need for solid partnerships between health systems and innovative companies focused around value. At first glance these predictions may sound gloomy, but there is a silver lining here: by confronting 2016’s potential industry missteps now, we can take action sooner. We are in the midst of a disruption akin to the conditions present at the time of the American Revolution, with a similar opportunity to draft a new and better charter for healthcare delivery broadly. That’s worth getting behind. This entry was posted in Uncategorized and tagged AirStrip, Consumerism, health, healthcare, interoperability, mhealth, technology, Value-Based Care, Wearables. Bookmark the permalink.